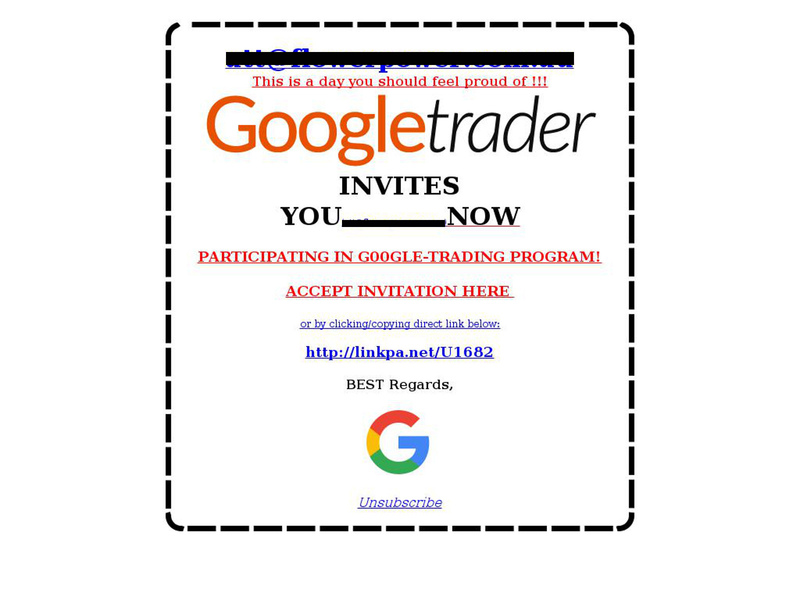 This email scam attempt poses as Google and is claiming to invite you to a trading program. It is an extremely poor attempt to compare to Googles normal high standard of presentation. If you don’t already know, Google is an American multinational technology company and is one of the most recognisable companies in the world. Keep reading to find out more about this scam attempt and be sure to delete it from your inbox. 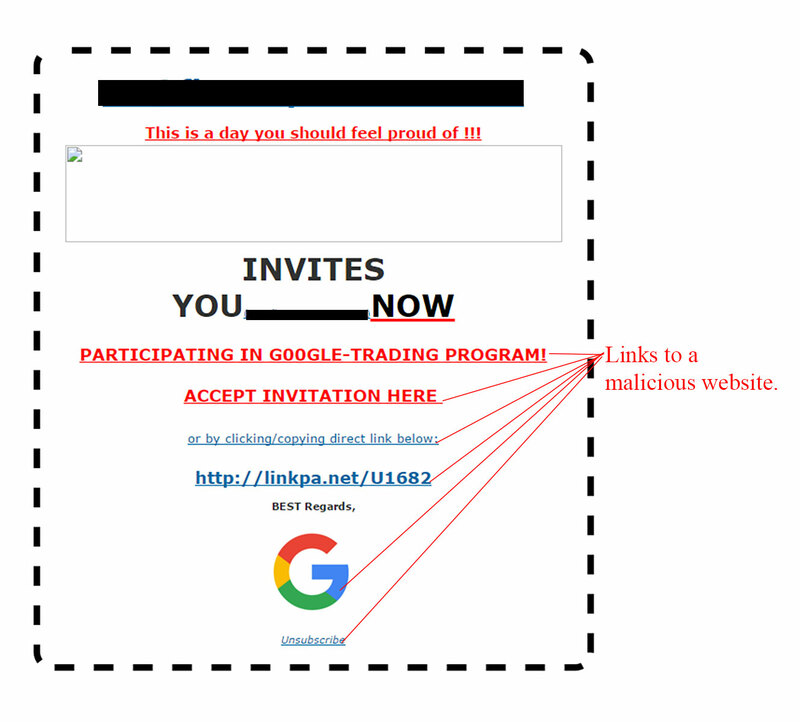 Figure A is a copy of the Google trading program invite scam email. It is very poorly branded and outdated. Looking at this email you can basically assume it is spam with no more effort needed. It includes the receiver’s email address in an attempt to instil confidence (in black for privacy reasons). The image is broken and the general layout and text is appalling. The subject line reads “Google Invites [receivers email]” as an attempt at a personal approach. The sender is shown as “Google Team” however, as expected the email address used is in no way associated with the official Google website and is clearly spam. There are several malicious links within the email as shown below which will lead you to a malicious website. Figure B is the web page you will land on if any links within the email are clicked. It is again very poorly designed and is an exact match to the email’s contents, the only difference is the image is not broken. This could be a tactic to confuse you into clicking again as if it hadn’t opened correctly. Be warned this will still lead to a malware infection. It is best to not click the original email to avoid reaching this page and further confusion. This attempt is very poor but may confuse some receivers so as usual, we suggest you delete it from your inbox straight away if you were unfortunate enough to receive it. If you are ever in doubt with an email from Google, it is best to get in contact with them directly or do your research before opening or clicking.